Who doesn’t like a holiday that centers around eating? Well, this one incorporates quite a bit of Coronas and tequila, but still… Here’s a Mexican-flavored meal that incorporates something grilled in each recipe. I went to a Cinco de Mayo party over the weekend and wasn’t sure what to bring. 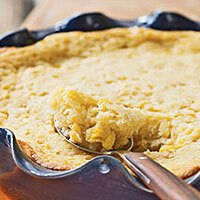 Then it came to me: Corn Casserole. I have made it before, and always get raves. I think it’s good for a brunch, for a cookout, to go along with chili as well as with ribs or pork butts. The initial recipe is from Cooking Light magazine (link takes you to “My Recipes” but it’s the same one)—don’t let the “light” turn you away. So moist. I made some changes, which I have incorporated below. I didn’t come home with any leftovers. Combine first 5 ingredients in a medium bowl; stir well. Add in the corn muffin mix while stirring, then the cheese. Pour into an 8-inch square baking dish coated with cooking spray. Bake at 350° for 45 minutes or until set. NOTE: Add some diced jalapenos or red peppers for more color and heat. Smoked bacon pieces would also be really good in this. The hubs made this just last week (although he oven-roasted it) for a party of 8 people. Amazing. The mustard, coarse pepper and vinegar makes a crust. So good. Original recipe from Ina Garten/Barefoot Contessa. Mix all ingredients together, applying to the beef. Wrap in plastic wrap and place in fridge for a few hours. About 30 minutes before cooking, take out the meat, unwrap it and place on a baking pan with a lipped edge; ideally this should sit at room temperature for a few minutes so it isn’t placed on the grill ice cold. The key to this roast is slow cooking over indirect heat. Heat up grill to about 400° then turn it down to low, using one burner (or loading the charcoal to one side only). Place the meat on the other side of the grill, away from the direct flames/heat. Keep the grill covered. (NOTE: to expedite cooking, you could roast in the oven set to 400° to “sear the outside” for about 20 minutes and then transfer to indirect heat on grill.) If you have a gas grill, try to maintain a temperature of 350°. 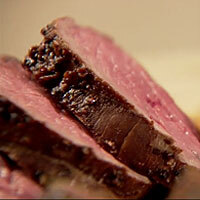 After about 1 hour, check the temperature of the meat periodically—about every 30 minutes or so. When the internal temperature of the roast is about 5 degrees below the temperature of the wellness you want, take off the grill and transfer the roast to a platter and cover with a foil tent to rest for about 15 minutes…it will still continue to “cook” for a little while longer. (This makes it Cinco de Mayo appropriate). Sauce recipe courtesy of Epicurious. Makes about 1 cup. In a heavy skillet cook the bell peppers in the oil, covered, over moderately low heat, stirring occasionally, for 25 to 30 minutes, or until they are soft. In a blender purée the mixture with the chipotle, the Worcestershire sauce, and salt to taste. The sauce may be made 2 days in advance and kept covered and chilled. Transfer the sauce to a sauceboat and serve it warm or at room temperature. I haven’t tried this yet, but it is on my radar to do so ASAP. I absolutely love grilled pineapple (it’s great with rice, fish, chicken…rum….). This recipe is from Confections of a Foodie Bride. Thank you Shawnda! * The pineapple should be grilled and chilled, so plan ahead. You’ll need about an extra hour in prep time so you don’t melt the ice with the warm fruit. To grill pineapple, remove the husk, slice into 1-inch-thick rings, and place on preheated grill grates. Cook about 4-5 minutes each side until nicely caramelized. Transfer the pineapple (and all accumulated juices) to a bowl and place in the fridge until cold. 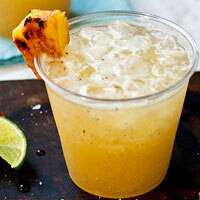 Add the tequila, margarita mix, liqueur, the pineapple juice from the bowl, and a slice of grilled pineapple to a blender. Pour over crushed ice and garnish with small chunks of grilled pineapple, if desired.